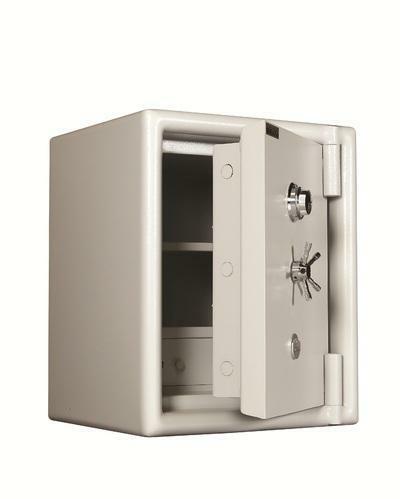 A high-quality Burglary Resistant Safe resistant safe that offers a high level of security. It is a high-quality fire and burglary resistant safe that offers high levels of security to apartments, private homes, businesses and executive offices. It is most suitable for commercial applications. Bolt Work Mechanism: The door is provided with solid flanged of 5 mm steel plates on four sides, forming a locked case. Depending on the size of safe have a varying number of 32 mm dia. shooting bolts as per IS 550 (2005). Strong movable shooting bolt is evenly spaced to secure the door on the two sides, which make it impossible to dislodge the door by cutting through the hinge. Any pressure exerted on the lock bolt on one side automatically bring into play equal balancing pressure on the opposite side to neutralize and defeat the attempts to dislodge the lock. A two-step lock case construction offers better resistant again the fire and burglar attacks. Automatic Re-Locking Device: A standard feature on all models of safe, this sensitive device is triggered-of when an attack is attempted on the lock through the keyhole with any instrument. This automatic re-locking device guards all the key locks.Locking Mechanism The locking mechanism is operated by a handle in the front and controlled by superior quality, dual control, and high precision 10 levers lock. These locks are unpickable and only the original keys will open them. Choice of Locking Arrangement Additional dual control lock can be fitted on various models. Keyless numerical 3 or 4-wheel combination lock, offers a choice of nearly million combinations for setting and resetting. The dial of the lock can be made inoperative by locking it for extra security. Timelock can be fitted; imported superior quality electronic/mechanical UL listed lock with multiple clock movements. Finish: All steel components are thoroughly cleaned from rust, mill scale, dust, dirt etc. and treated for anti-rusting, followed immediately by coats of high-quality zinc chromate primer. Then the safe is given successive under coats and finally a finish coat.